Drinking plenty of herbal teas loaded with vitamin C is a great way to help support your immune system while increasing your antioxidant intake. Vitamin C is required for the growth and repair of all tissues in your body. It aids the body in making collagen which is an essential protein that blood vessels, the skin, ligaments, tendons and cartilage all require. Healthy bones and teeth are the result (in part) of vitamin C.
Yes, vitamin C is an antioxidant and along with vitamin E, beta carotene and other nutrients. Antioxidants are needs to thwart off diseases, cancer, arthritis and pre-mature aging. If you are a smoker then beware! Smoking reduces the levels of vitamin C in the body; how much depends on how many cigarettes are smoked a day. So not only are vitamin C levels being reduced, as a smoker more of this vitamin is required because smoking damages cells. To make up for this loss many herbalists and even medical doctors recommend up to 2000mg per day, but this is something that needs to be discussed with a qualified health professional first. This especially applies if you are pregnant, nursing or on medications. Signs of vitamin deficiency include dry and splitting hair; gingivitis, bleeding gums; dry, rough, scaly skin; easy bruising; nosebleeds; and a decreased ability to ward off infection. A severe form of vitamin C deficiency is known as scurvy. Low levels of vitamin C are associated with a number of conditions, including high blood pressure, gallbladder disease, stroke, some cancers, and atherosclerosis, as well as the build-up plaque in blood vessels that can lead to heart attack and stroke. Getting enough vitamin C from your diet by eating lots of fruit and vegetables may help reduce the risk of developing some of these conditions. However, far too many cultivated vegetables are now grown in nutrient-deficient soils across Canada and the United States so never trust this source. There is no shortage of what you can drink that will help to increase your vitamin C levels naturally. Of course there are supplements but unless they are water soluble, they are pretty much useless. Vitamin C is also sold in powder form as well as in a liquid form. Enjoying herbal teas made from plants and trees that are rich in vitamin C is the best supplement you can nourish your body with. One of the best sources to get vitamin C is from the pine tree, white pine in particular. Although all pine trees make a healthy drink, white pine it superior. White pine needles are loaded with vitamins A and C, and it doesn’t end there. The vitamin C levels are so high (on average 5 times greater than lemons) who needs oranges! We’ve all heard about the power of resveratrol – pine needles have it! They also have quercetin, flavonoids, tannins, pine oils, anthocyanins, proanthocyanin and much more. Purslane (Portulaca oleracea): also contains beta-carotene, omega-3 fatty acids and vitamin E.
Violet (Viola odorata) (flowers and leaves): high in vitamin C.
Lamb’s Quarters (Chenopodium album): This ranks as one of the most nutritious sources of food. High is vitamin C and A, lots of iron and packed with protein. Dandelion (Taraxacum officinale): Rich with vitamin C, A, iron, calcium and much more. Common mallow (Malva neglecta): Lots of vitamins C and A as well as selenium, iron, calcium and more. Rose hips (Rosa canina): High in vitamin C.
Fireweed (Epilobium angustifolium): Loaded with vitamins A and C.
Before using any of these if you are on medications, are pregnant or lactating, please check with a qualified health professional before making any herbal tea. Be sure to make lots of these teas – and use them as a base for your soups and for making rice!! 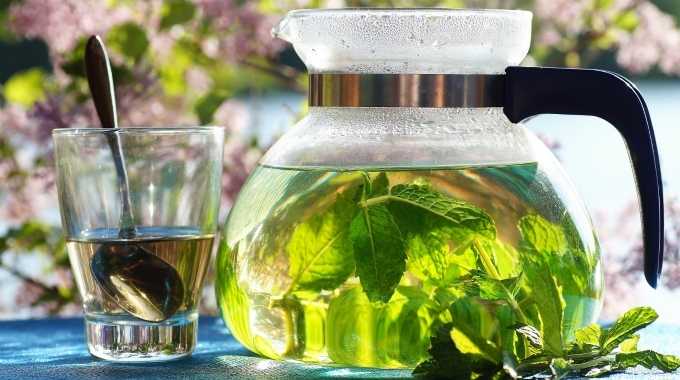 Unleash the culinary imagination and when a recipe calls for water – use an herbal tea to infuse the extra nutrients into whatever you bake or cook! Support your immune system, increase your antioxidant intake and nourish your body by drinking plenty of herbal teas loaded with vitamin C this winter – and always! Vitamin C is an essential nutrients that our body needs but what are those tea that are rich in Vitamin C and at the same time a healthy one too? According to what I’ve read from http://organicindia.mercola.com/tulsi-tea.aspx that each tea have different composition when it comes to their benefits. It will all depend on the amount of consumption and weather it is what your body needs too. So choosing the right tea for yourself is the best thing to know first. This article is very useful to me because I drink only herbal teas as I have a digestive problem and am liable to get low in vitamin C and minerals. So seeing how herbs can help is great. I didn’t recognize all the plants mentioned but amazed about the high vit C values in pine. Cool information and useful. Your website is the best – love it!! One time I was completely out of tea. Where I live we have a lot of Pine tree’s. I was looking out my window and thought why not give it a try! I went out and gathered a few tips of the branches. I cut the needles up a little bit to release the oils and simmered them for five minutes. I added one drop of peppermint essential oil to the mug. It tasted like a cup of Christmas! It was delicious! I’m glad to find out here that I had a serving of vitamin C!